Today, Roll20® and Paizo Inc. unveiled the official support of Pathfinder® and Starfinder® roleplaying games on the Roll20 virtual tabletop. 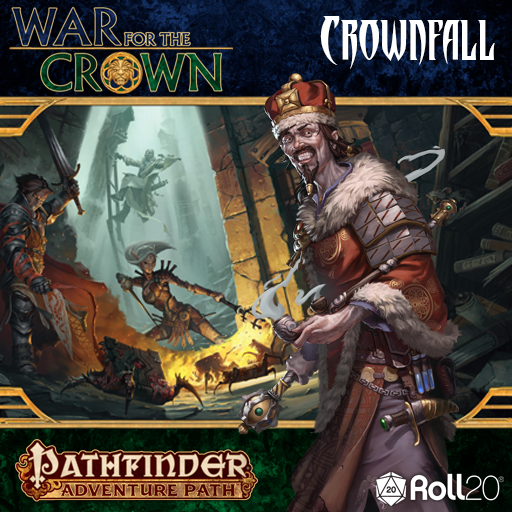 Pre-orders for Crownfall, the first volume for the Pathfinder War for the Crown Adventure Path, are now available on Roll20. Thereafter, more War for the Crown volumes, monstrous Bestiary content, and Starfinder support will roll out in 2018. The Roll20 Virtual Tabletop provides a full suite of easy-to-use digital tools so players can build characters and run campaigns seamlessly through their web browser. With character sheet automation, simple click-to-roll attacks, and built-in video and voice communication, players can quickly craft stories as a group. Pre-made adventures and fully-integrated bestiaries allow Game Masters to run games with minimal setup, while effortlessly enjoying features such as dynamic lighting and advanced fog of war to build tension on what's right around the corner… or creeping up from behind.